← NEWS: Kia Sponsorship Extended Until 2019… And Then…??? Most people have an idol. For a generation of female cricketers, that idol will be Charlotte Edwards. For Charlotte Edwards, it was always Jan Brittin. By that point Brittin had been playing international cricket for 17 years, having made her debut in June 1979 at Teddington, in an ODI against West Indies. Her career would last a further two seasons, when in 1998 – shortly after breaking the record for most Test runs during that summer’s women’s Ashes series – she finally hung up her boots. It was a career that overlapped with those of both the late, great Rachael Heyhoe-Flint, and with the recently retired Edwards. During those years Brittin witnessed a period of great change for the women’s game, epitomised by the shift from skirts to trousers at the start of her penultimate series in England, against South Africa in 1997. Brittin herself was at the forefront of that shift. Always an athletic fielder, renowned for her dives at cover – she retains the record for most World Cup catches, with 19 to her name – it was her sliding stops and badly grazed legs which helped to convince the cricketing sorority that skirts were no longer suitable for international cricket. Born in Kingston, Surrey, in 1959, she was a naturally talented sportswoman from a young age, representing English schools at athletics; she eventually achieved the rare feat of becoming a triple international, adding indoor hockey and indoor cricket to her mantle. Cricket came relatively late in the day: at 12 years old her grandparents took her to a Steam Engine Fair, where she was attracted to a catching machine. Her catching skills were such that she was recruited on the spot for a local club by the lady operating the machine. County cricket and Junior England soon followed. Asked once about the greatest influence on her career, Brittin replied: “my family – for their love and support and financial backing”. Her father, Kevin, helped to instil in her a love of sport: he had played junior football for Spurs, and was later a part-time professional at Reading, as well as a keen club cricketer. Her parents ran a sports shop in Surbiton, where Jan sometimes helped out. But as an only child it was the practical support her parents offered that was most crucial. “That helps a lot when, for the privilege of playing for England in a Test match in this country, you have to pay for your own petrol to get there,” she remarked wryly, in a 1984 interview for the Daily Mail. 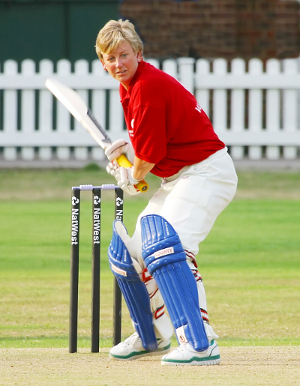 Playing as an amateur for the whole of her career, at a time when there was very little money at any level of the women’s game, and when every pound of sponsorship had to be fought for, Brittin juggled cricket with firstly her studies at Chelsea PE College, and then with her work as a manager for British Airways. There was very little media coverage of women’s cricket in the 1980s, but Brittin’s talent was nonetheless an irresistible draw. The breakthrough came over the winter of 1982/3, a season she spent playing in Western Australia. England Men had surrendered the Ashes, but Brittin returned home in February with a season batting average of 110. A classical batsman, she was from that point on termed “the girl with a touch of Gooch”, a label she happily accepted. When her photograph appeared on the front cover of The Cricketer in October 1984 she became the first female player to be awarded such prominence; when Kwik Cricket was launched in January 1988 as a response to the near death of cricket within state schools during the 1980s, the launch was attended not only by Mike Gatting but by Brittin – very much England Women’s premier batsman of the day. Despite the fame she remained a quiet and self-effacing person, happy to let her batting do the talking. And talk it did. Her debut Test century came against New Zealand in 1984, followed up with scores in the next two Tests of 96, 63 and 35. She was, unsurprisingly, chosen as Player of the Series. Four more Test hundreds would follow – her highest score coming in 1998, in the penultimate match of her career, as she hit 167 against the Aussies. The runs just never dried up. Never one to wallow in plaudits, she was happy to remain largely out of the spotlight after her retirement from cricket in 1998. Nonetheless her place in the record books is secure. No one has yet surpassed her record of 1,935 Test runs. No one is ever likely to.